Situated in a rural location, this country house is within 3 mi (5 km) of Bains MTB Trails, Breytenbach Centre, and Doolhof Wine Estate. Nederburg Wines and Boschenmeer Golf Estate are also within 16 mi (25 km). Situated in Cape Winelands, this spa guesthouse is 2.3 mi (3.6 km) from Bains MTB Trails and 3.1 mi (5 km) from Breytenbach Centre. 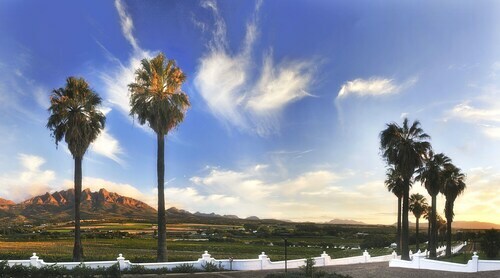 Doolhof Wine Estate and Nederburg Wines are also within 9 mi (15 km). 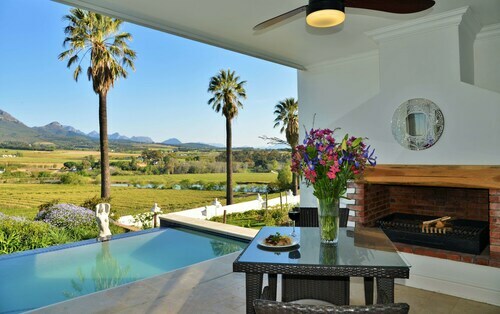 Situated in Cape Winelands, this bed & breakfast is within 9 mi (15 km) of Doolhof Wine Estate, Nederburg Wines, and Rhebokskloof Estate. 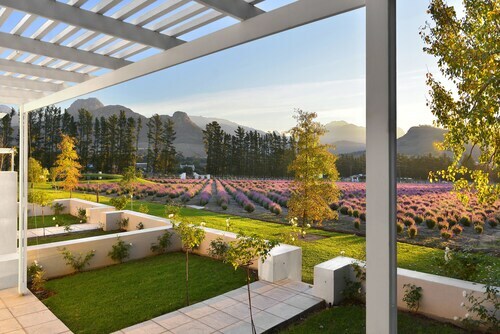 Paarl Mountain Local Nature Reserve and KWV Wine Emporium are also within 12 mi (20 km). 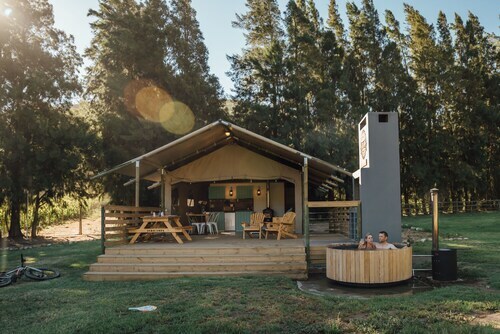 Situated in Cape Winelands, this tentalow is within 1 mi (2 km) of Doolhof Wine Estate and Bains MTB Trails. Breytenbach Centre and Nederburg Wines are also within 12 mi (20 km). 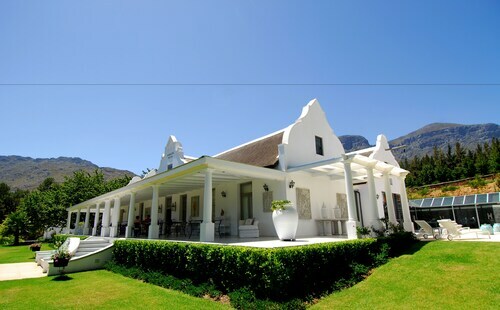 Situated in Cape Winelands, this luxury country house is within 1 mi (2 km) of Doolhof Wine Estate and Bains MTB Trails. Breytenbach Centre and Nederburg Wines are also within 12 mi (20 km). 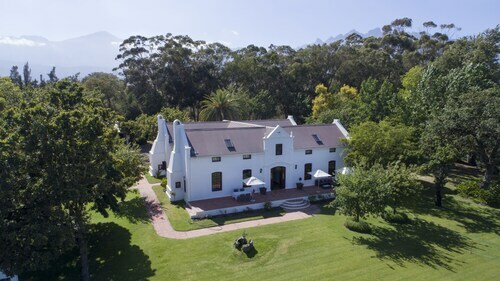 Situated in Cape Winelands, this luxury guesthouse is 2.3 mi (3.6 km) from Bains MTB Trails and 3.1 mi (5 km) from Breytenbach Centre. Doolhof Wine Estate and Nederburg Wines are also within 9 mi (15 km). Hotels in Wellington start at $60 per night. Prices and availability subject to change. Additional terms may apply. Around 40 miles (65 kilometers) to the northeast of Cape Town's downtown area, you'll find the neighborhood of Wellington. Think about calling on some of Cape Town's notable attractions, including the Cape of Good Hope and Robben Island, while making plans to visit Cape Town's well-known tourist attraction, the Table Mountain. 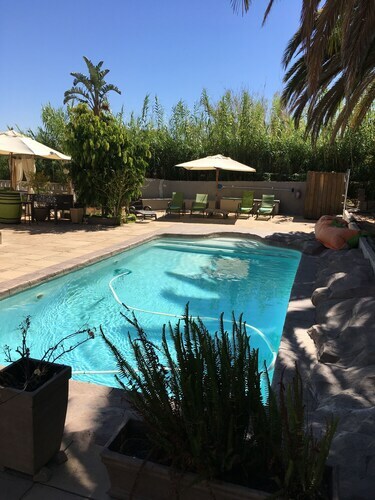 If you and your family are planning a vacation in Wellington, you can spend a few nights at the Monte Vidéo Guest House, which is a leisurely stroll away from the Breytenbach Centre. Alternatively, you can book a room at the Diemersfontein Wine and Country Estate, which is near to the Bovlei. Planning a vacation in Cape Town? Consider traveling to Mowbray, situated around 40 miles (62 kilometers) from Wellington. On our Mowbray hotels guide, you will be able to find a nice selection of hotel options. Travelocity's user-friendly accommodations page contains some Cape Town places to rest and relax. Lovely in every way. Room Was spacious, well decorated, and clean. The entire property was gorgeous, well maintained, and nicely decorated. Breakfast staff was attentive, friendly, and the breakfast was adequate- hot breakfast made to order and cold breakfast was with selection you would eat and not too many unne extras. Staff is sincere. Watched Don do a very kind thing that warmed my heart and endeared me to him- our Uber driver hit a post. I knew that the driver panicked In case of extra expense. There is a very wide disparity of class in Franscchoek. Don was called, he looked and kindly told the guy it’s ok. Yes the accommodations were beautiful and everything was perfectly adequate, but also consider patronizing owners who are downright good people.